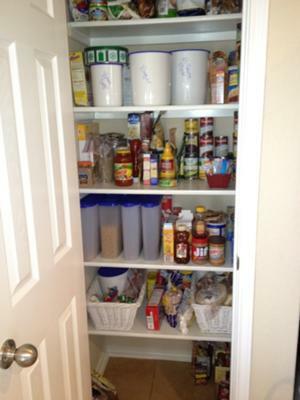 Lots of people have sent me in their pantry storage ideas, shown in pictures, for this hall of fame. 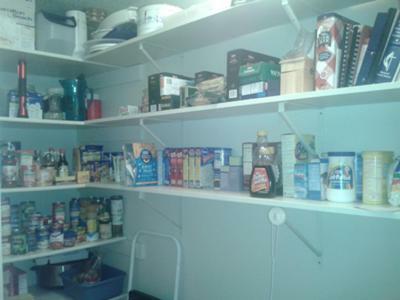 These before and after pictures are from participants in Week #3 of the 52 Week Organized Home Challenge, where we tackle our food storage areas. If you get inspired by the ideas and results you see below (scroll down to see all the pictures) I encourage you join the challenges yourself, and work some magic in your own pantry. Just follow the step by step instructions in the challenge listed above, and be sure to take before and after pictures as you go, and you can get featured in the Home Organization Hall of Fame too! 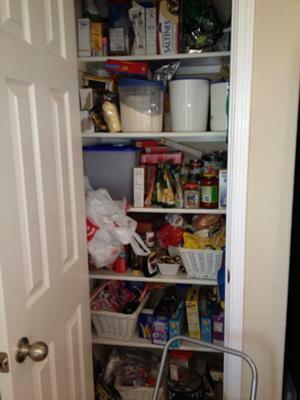 Jennifer from Life of Reilly shared her before and after pictures from the Organizing Pantry Challenge too. I think she did a really great job, and she added more pictures to her blog post showing close ups of each shelf (so go to her blog to check those out). 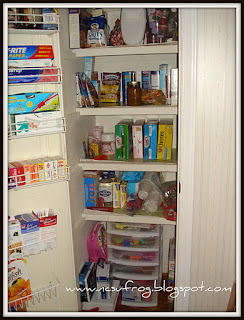 What I liked most about her organizational scheme, and one of the best pantry storage ideas I've heard, is that she organized the pantry in a way that both she and her husband understood. It really doesn't matter how brilliantly you organize something, if you're the only one who understands it things will quickly get unorganized again. That's why having everyone in the house understand the organizational system adopted is so crucial. Great job Jennifer! In addition, I noticed she used hooks on her pantry doors to hold some cleaning supplies and other items she uses in her kitchen. 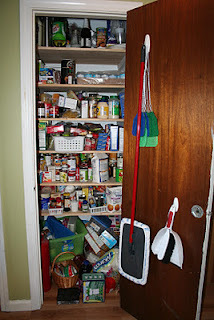 That is also a great use for wasted pantry door space! It looks like she used Command Hooks (although I can't be totally sure from the picture alone). I absolutely love Command Hooks (see picture to the right) since they are easy to install and to remove, when you want. 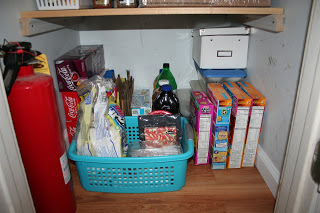 I first took everything out, wiped down the shelves and then organized things according to categories such as baking, adult's snacks, kid's snacks, quick meals, etc. Then I threw out anything old, outdated or just nasty looking (always a shocker how much of that there is!) and slowly added everything back to the shelves. I tried to place things at the best level for the need of the item, and kept things I use often from being blocked, such as flour and sugar, but pushed items I don't need often to the back (cornstarch, doubles of items, etc). Then I carefully added things to my crockpot for supper tonight, just to get rid of some things I don't use often but have been there awhile, such as a can of beans, potatoes that need to be eaten or they might eat something soon, and a can of chicken broth to make my lemon chicken crockpot meal that much more delicious and filling. Then I showed my boys the bottom shelf, where there snacks and things were easily accessible, and I threatened them (ha ha) to get them to keep it organized--I give it three days--and stood back to proudly admire my work. 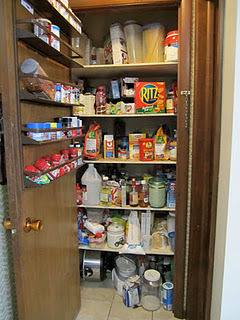 My husband came in while I was standing there and was shocked at the space in the pantry. Success? I think so! Yes, I agree Adrienne, I definitely call it a success. Thanks so much for sharing your pictures with me. I think everything looks wonderful, and I hope your family helps you keep it organized! Cleaned and Organised Before and After Pics- Labels too! Oooo, I love it Pauline! I especially love your children showing off the pantry in the second picture. How cute! You should be very proud of your hard work. Thanks Taylor!!!! I used, wait for it... empty moccona coffee containers as well as some fowler vacola containers that my hubby picked up at a garage sale ages ago! I am really enjoying these challenges and thank you so much for posting my photos! 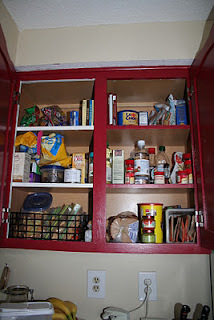 Angela from Confessions of a Craft Addict showed the before and after pictures from her pantry organization on her blog (plus an update where she updated her pantry even more with new matching canisters). 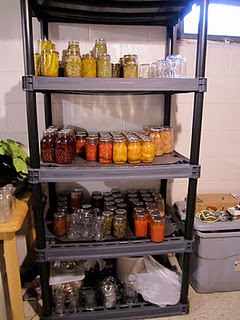 I like that she has come up with a creative storage solution for her home canned and preserved food, since she's got a small pantry. 3. Give away - anything that probably wasn't actually going to get used, or duplicates. This will go to the food pantry. I like her plan to categorize various areas of her pantry, that work and make sense for how she cooks and her family uses food in her home. 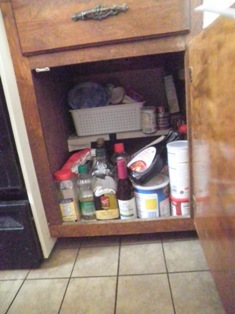 I took all of the bottles of oil, vinegar, worcestershire sauce, etc. and put them all on a metal cookie sheet. This will help control drips, and also makes it easier to slide the tray out, look for what I need, and put it back. 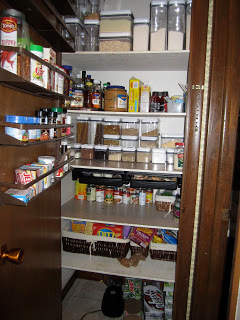 I noticed in her pantry that she uses her pantry door as additional storage space, with the addition of some shelving units screwed into the door. That's a great use of otherwise wasted space. 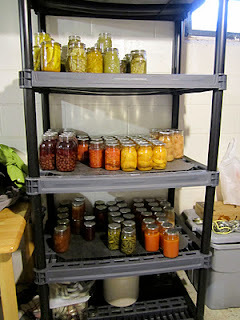 Tina showed her success, and some set backs, in the third challenge, and asked for some pantry storage ideas. 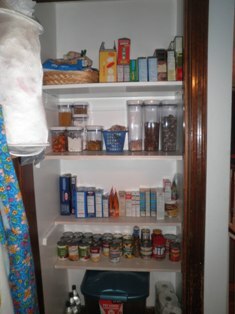 Overall, she had success with her pantry organization (I could only add some of the pictures, so I chose the "after" ones -- check out her blog post for more pics.) 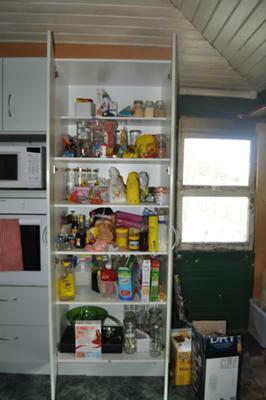 However, she described her "problem area" which is the cabinet above her stove. I think we've all got a cabinet or two in our kitchen that we can't reach well, and this is hers. Unfortunately, since she can't reach it well, but she needs to use the stuff in it it causes a problem. My suggestion is to move these items to an area she can reach better, and contain her spices in cute little baskets or even shoe boxes without lids to keep them better contained. In addition, you can check out the Organizing Your Spices Hall of Fame as well, where I've collected lots of pictures from readers of how they've tackled their spices. 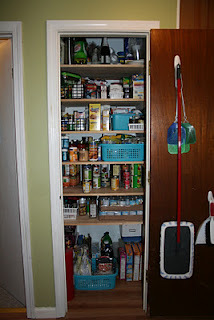 I didn't realize how messy and unorganized my pantry was until I tackled it this week. Jillian, these pictures are great, and I can tell you did a really good job in your organizing project! I love the OXO Pop containers too. I don't personally have a set but I've heard such great things about them, both from readers of this blog, and also doing research for the site itself, that I really want a set one of these days! 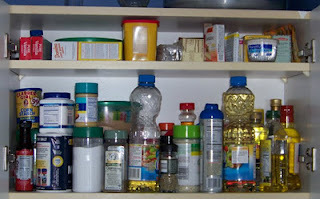 They look really good in your pantry, and I hope they help you keep in organized. Please show me more pictures from other challenges, as you finish them. "I bought some Oxo containers, a 12 piece set, at Sam's. It was by far the best price. I loved the first set so much I bought two more. I keep chips and crackers in the larger ones rather than the original packages. It has definitely reduced the amount of food we waste because they seal well to keep food fresh, and because they are clear so we can see what is in the pantry to snack on." 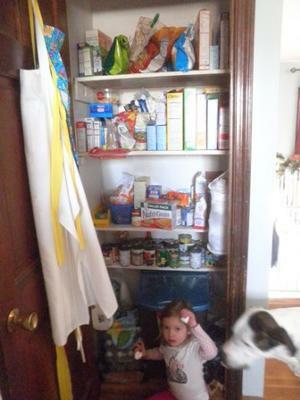 I have been blessed with a walk in pantry but it tends to get out of control pretty easily. Before I started, I had bags and bins everywhere and it was a bit like walking through land mines to get to the items I needed. I'm challenged with really deep shelves on one end so things tended to get lost back there. I started by grouping items. I can see everything now and I use the back space for those little used items. 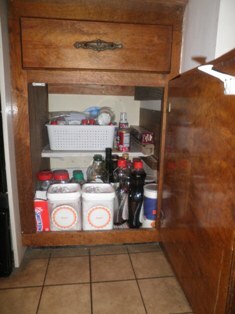 I still have cleaning supplies in here, but they are contained to a separate cabinet in one corner. I still also do my recycling in a corner and use the wall space behind the door for my brooms etc. My kids now enjoy easily finding something for a snack after school and I can easily see when I'm running low. That's wonderful Tracy. The best part of your organizing is how it's helped you and your kids enjoy and use your home better than before. It's nice for things to look nice after organizing, but functionality is really what is most important! In addition, you say you've got cleaning supplies and recycling in your pantry, like it's a bad thing. It's not. You can keep these things wherever they fit and make most sense for your home (as long as cleaning supplies are somewhere safe, out of the reach of children, for example). The only time I don't recommend keeping such things in the pantry is if there isn't room for all the food then. If there is, use the extra space still available for whatever makes sense! 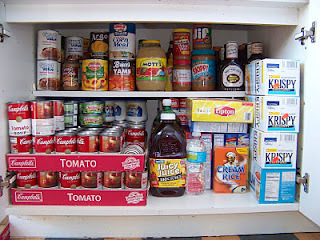 Crystal showed her efforts in doing the pantry organization challenge. I'd say she had some great results, and loved how she explained it only took about half an hour plus a really big trash bag to accomplish it! 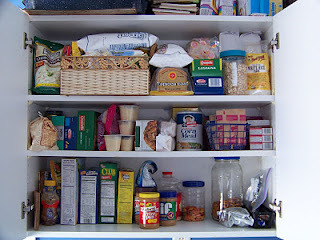 There were a couple of things I noticed when looking at her pictures that I'd like to point out, because she's got some really good pantry storage ideas here. 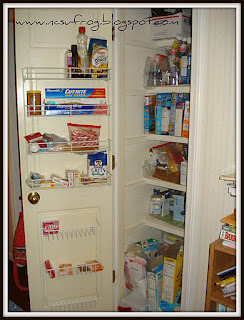 The first is that she used otherwise wasted space on her pantry door to add more storage, and that is a great strategy. In addition, I notice that in the after picture she's added a moveable plastic set of drawers into the bottom of her pantry. 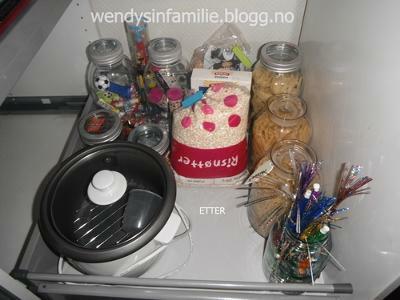 I love this idea, because a lot of times it can add more storage for small things, that can be divided, drawer by drawer, using what otherwise could be either wasted or cluttered space. I am a big fan of these drawers, since if you ever decide you don't want them in your pantry anymore you'll surely find another use for them, somewhere else, in your home later. I have had drawers like this for years, and have moved them around in all kinds of ways as I've changed what needs organizing in various places in my home. 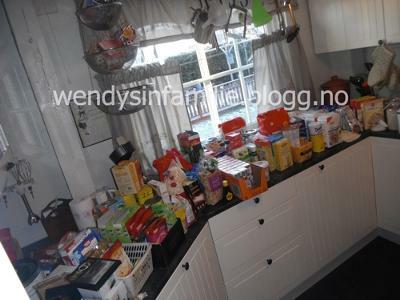 Wendy from wendysinfamilie, who lives in Norway, is following along with the Challenge too, and has blogged about some of her results, as well as translating the steps of some of the challenges into her language. How awesome is that? She says on Home Storage Solutions 101's Facebook wall: "Hi there. 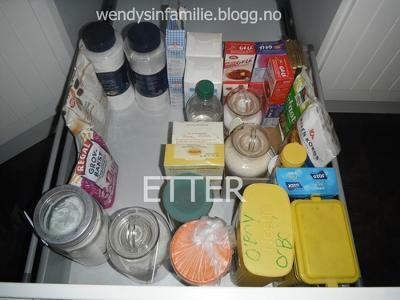 I found this challenge through my cousin who lives in Utah USA, and I'm posting every week on my blog about it here in Norway, adapting it to our lifestyles as good as I can, hoping to get through all 52 weeks." She looks like she made some great progress this week, doesn't it? 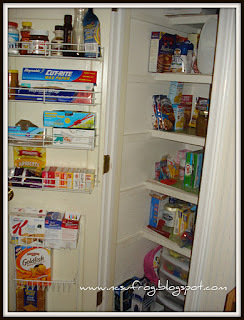 I hope all of these pantry storage ideas have given you some inspiration for what you can do in your own home, in your food storage areas. 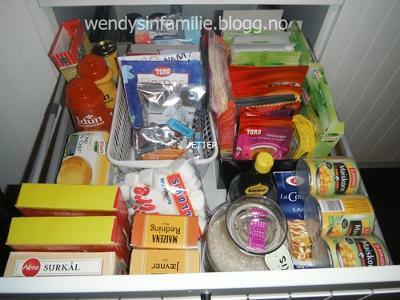 Clearly, although you can use lots of pantry storage solutions you really don't need much to get this area of your home organized. If you like what you've seen though, why don't you join the 52 Week Organized Home Challenge here on the site? Over the course of the year we're tackling every room and type of item to get your home and life under control slowly, but consistently. I hope you'll join us! 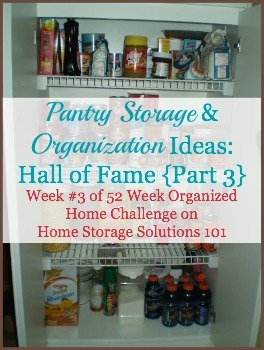 If you do work on your pantry, I'd also love to celebrate your accomplishments, so send in your before and after pictures here, and I'll feature you in the hall of fame as well. I use the area on top of the air return. There are some shelves there but it is deep and dark. Any suggestions?